Scholars Day is the opportunity for students nearing graduation to show the value of the courses they’ve taken to earn their degree. It takes place in December and May of each academic year. Scholars Day recently was held Monday, Dec. 11. 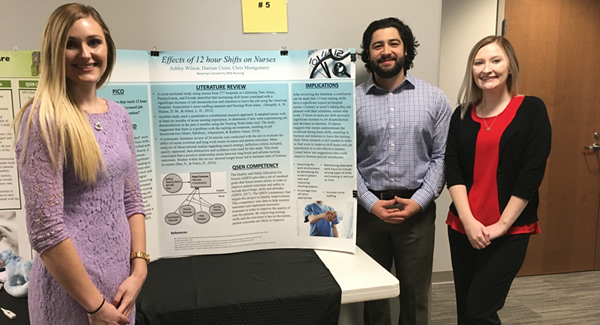 “Students present the knowledge they’ve gained or scholarly work that they’ve attained throughout their college career,” said Nancy Dahlinger, assistant professor and director of the occupational therapy assistant program. Students are able to choose whether they present their information on a poster, by oral presentation or a by giving a performance. The presentations are a requirement for graduation and are graded as pass or fail, Dahlinger said. Students are given presentation requirements and standards earlier in the semester. For three hours on Monday morning, students flowed in and out of Bishop Gerber Science Center (BGSC) dressed in business clothes with notecards in hand. Poster presentations were held in the upstairs hallway of BGSC while oral presentations took place in three first-floor classrooms. Performances were held in the Jabara Black Box Theater located in De Mattias Hall. The upstairs hallway was lined with posters presented by both individual and groups of students and ranged in variety from science to art and everything in between. Senior Gladys Venzor will graduate in December with an elementary education degree. 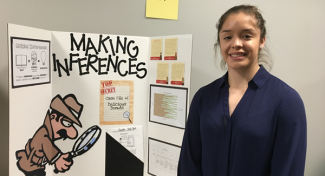 She has been student teaching this semester and did her poster presentation over the success of her “five-day unit” about making inferences. She tested her fourth-grade classroom on their knowledge of making inferences. 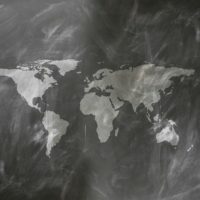 She then worked for five days to integrate knowledge of inferences and what they entail in the classroom and then gave her students a post-test. Students started with very little knowledge or understanding of the subject and finished the week with a thorough understanding. Venzor looks forward to teaching fourth grade at Resurrection Catholic Grade School this Spring. 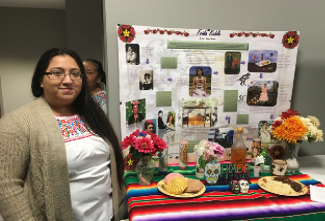 Majoring in accounting and management and minoring in pre-law, Anna Romero chose to do a presentation that showcased famous Mexican painter Frida Kahlo. “The way she speaks about the Mexican culture and the way she represents our indigenous roots is what I really like about her,” said Romero. Her poster clearly represented Kahlo and the many struggles she went through in her life. Sports communication major Jazzmen Ortiz chose to focus on a leadership course she took and created a poster about media personality Oprah Winfrey. “I chose Oprah because I think she displays a lot of traits that most leaders or all leaders should show.” Ortiz talked about the importance that leadership holds no matter what career field you enter. Julian Montes, psychology major, gave an oral presentation titled “Mindfully Managing Self” that largely focused on leadership. He talked about his journey from a young high schooler to a grown college student. He had many successes at both Butler Community College and Newman University and used each experience as a learning opportunity. Going from president of the HALO (Hispanic American Leadership Organization) at Butler Community College to “just another kid on campus” at Newman was an adjustment for Montes. Montes was a part of the Collegiate Career Advancement Program and was an intern at the Kansas Leadership Center. He had great ideas for bettering the community and with motivation from his friend, began to work for months to bring his idea to life. Montes created and organized the successful Midwest Multicultural Leadership Conference. Luca Anelli gave an oral presentation that summarized his work on the ways in which religion, happiness and gratitude affect peak performance. He surveyed 58 participants about their levels of religion, happiness and gratitude related to their performance and if they ever reach a state of peak performance. 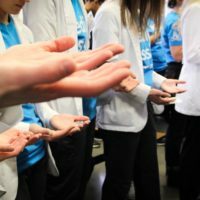 This idea stemmed from a Newman Studies Program (NSP) course called Mindful Leadership. He found there to be a positive correlation between the three variables and achieving peak performance. 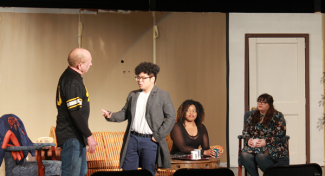 There were two Scholars Day performances in the Jabara Black Box Theater this year. Seven students enrolled in the NSP course,”Stories in Performance,” taught by Suzanne Berg, assistant professor of communications, and Mark Mannette, associate professor and director of theater, were split into two groups and asked to write a script that they would perform. Students spoke with family members about their lives and used those stories as inspiration for their scripts. The first performance — with a group of four — chose to delve into the subject of interracial marriage as the basis of their production. The second performance — a group of three — explored the relationship between grown siblings getting together, talking about memories and dealing with the present. 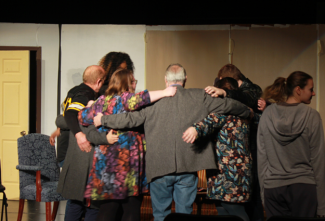 The students from the “Stories in Performance” class share a group hug after the performances are completed. After the two performances, the audience participated in a Q&A with the performers about their inspiration and writing process. Each student was enthusiastic about the course and thought it helped them grow both intellectually and personally. Scholars Day is a great opportunity for students to research something of interest and show professors, students and visitors their knowledge on the matter.